As the sun sets, a whole new set of opportunities and things to do in Belize arise. While strolls in the light off the moon and looking up at the stars might be perfect for some, there are plenty of places offering alternatives such as night-diving in the luminous blue ocean, or sipping a beverage at local bars. Compared to some other Caribbean Islands, the nightlife here is far more subdued. And though there are numerous night time facilities to visit throughout the country, only a few hang outs stand out from the crowd. A majority of the bars and clubs in San Pedro are situated right along the beach, giving them the optimal holiday vibe. Meanwhile, Fido's Restaurant and Bar is a great locale for night owls who are looking to relax under the thatch roof; enjoy live music, great food, and drink specials that change each evening. If, after lounging on a beach all day you’re looking for an energetic way to spend the evening, dance away at Jaguar's Temple, the city's premier night club. You can find a whole range of night spots in Placencia; from a sports bar to a bar where the drinks are straight-up, and even a beachy, open-air bar to boot. If you want to sip a few cold drinks while taking on your travel companion in a game of pool or watch a big game, Tipsy Tuna Sports Bar is the place to go. If you don’t need the entertainment or games, and just want a few drinks then try J-Byrd's Bar. On the other end of the spectrum, Barefoot Beach Bar at the Tipsy Tuna is super casual, with live music most nights and seats made up of beach chairs and towels on the sand. 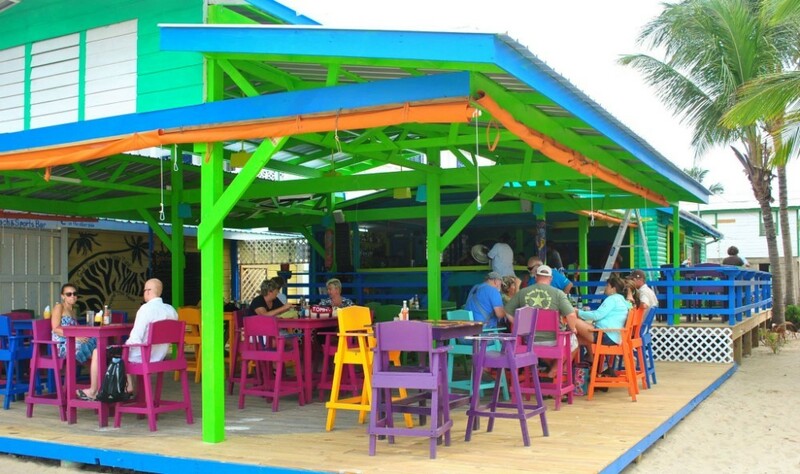 In 2013 Turtle Inn was named as one of the "Top 16 Beach Bars in the World," making it a must-visit bar when nearby. The same bartenders have worked here for years, and guests can't seem to get enough of their boisterous personalities and story-telling as they mix up their colourful cocktails in style. Reggae is king and relaxation in key Caye Caulker. The four most prominent bars, I&I Reggae Bar, Herbal Tribe, Lazy Lizard, and Oceanside all offer laid back, truly Caribbeans atmospheres and pump the reggae music most nights in their unique fashion. I&I Reggae Bar offers swings and hammocks as the primary seating, and you can snorkel right up to the bar at Lazy Lizard. Get dressed up and hit the town at least one night during your stay, whatever your idea of a fun evening is, when the sun goes down in Belize, you can truly unwind.